God’s Ternary Computer is formed by Non-Local Superposition of Holons of Holons of Holons; namely [Yin-Holon]—[Yang-Holon]—[Neutral-Holon], where Neutral is Free Will. This is equivalent to the Statement in Tao-Te-Ching: One-Holon produces Two-Holons, Two-Holons produce Three Holons [—->Holon within Holons], and Three Holons produce all GOD’s INVOLUTION HOLONS [—->the TAO within THE TAO]. 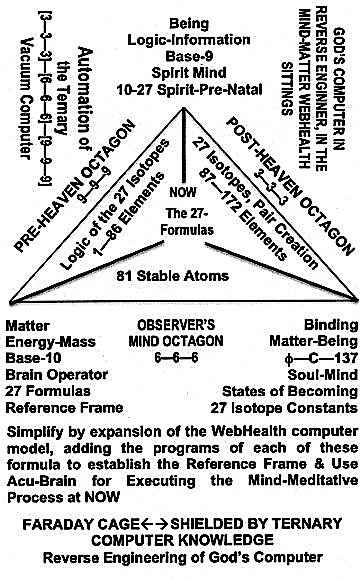 This is God’s Logic Big Bang that Created the Self-Participatory Logic-Information Vacuum computer. These statements are expressed in the diagram below. 27 Isotope Constants —-> Physical Constants of the Observed Isotope: The 27 Formulas à the 10 Celestial, 12 Branches, 5 Elements = 27 Pre-Natal Conditions of the Observer’s Birth and at time of observation, the Physical Constants of the 27 Isotopes, and the pair production connected to each of the 27 Isotopes within the 172 Element Table. The 27 Pre-Natal Conditions of the Observer is formulated in the WebHealth. The formulas related to the 27 Isotopes needs to be added. 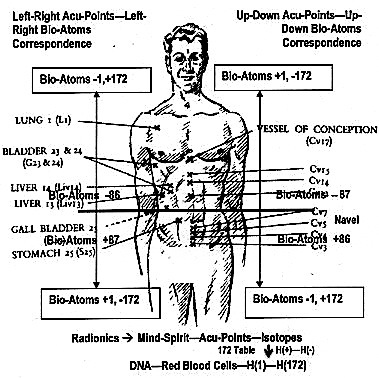 In addition, the 27 formulas for both Isotopes and Pre-Natal have direct or indirect effects on both spirit-mind and soul-mind, and are the background logic-information for any human observers. Acu-Brain —-> Its execution power and Related Chakra—Acu-Points–Affects are in the WebHealth experimental research. The research connected to the 27 Isotopes needs to be added to the program. Faraday Cage —-> These are the background Observer-Observed condition for all observation, except those specific targeted Observations that are uniquely directed to the Observer or the Observed. Therefore these background knowledge can be use in developing the Faraday Cage for shield unwanted Logic-Information. How much, how detail, how accurate can we model these 27 formulas are definitely a question to be answer. As shown in the diagram above, God Created the Computer with his Base-9 Input symbolized by 9—9—9, then the Logic-Information encoded by Observers 3—3—3 and 6—6—6. These inputs are Self-Created—Self-Participated—Self-Encoded into the Computer. Thus the Hardware of GOD’s Vacuum Computer are GOD—BEING—MATTER namely Observers, while the Software are Observer Self-Encoded. This self-encoding process simultaneously created a Logic Big-Bang. The non-locally superimposed Software —-> the programs—sub-routines—executing-outputting functions, form the Vacuum Computer. Executing God’s Computer by the Logic Software generated in Observer(s)—Observed(s)—Reference-Frame(s) is the Physicist’s Big Bang —-> Information-Energy or the Quantum-Universe, Quantum Collapses or Executing the Output-Function forms the Energy-Mass Universe. Notice, since both Big Bangs are Non-Local—Connected—Spaceless, and both occur at the Moment of NOW, there is no need for the assumption of an inflationary period. Furthermore, executing-outputs also created an evolving universe of matter and entropy with the condition Involution minus evolution equals to entropy [namely the Holon Involution—Evolution—Entropy generated], and the Matter-Being conservation condition in the Holon of information—Energy—Mass. Lastly, every Observer-Observed interactions in the Mind-Soul and Mind-Spirit States with God’s Computer are encoded. Since Mind-Spirit and Mind-Soul measurements involve with the Vacuum, these can only be detected in the form of Radionics, which involve “Mind reading & detecting” Computer Code and Code Execution inside the Vacuum Computer. All other experiments that involve with measuring meter, “pin-pong-balls”, and frequency (36 to 72 octaves) spectrum are outside the boundaries of the Vacuum Computer. These other experiments involve with Brain-Matter measurements; rather than, Mind-Spirit functions. There are three levels of the 37 Acu-Points: Level-1, The Organ Meridian—Level-2, The Chakra—Level-3, The Eight Mysterious Meridian. In conclusion, Matter Reality involves employing mathematics together with scientific experiments; while, Being Reality make use of mathematics derived from Being Matter [namely, Base-9—Base-10 Interactions] and Radionics for measurements. The former is left-brain dominate. The latter is dominated by the right brain. Integrate-synthesize both is the goal for WebHealth.